It is a perfect companion for eyeglass wearers: This is a handy case with good protection for those who have eyewear to carry, like prescription sunglasses or reading glasses or any other ones. You can easily place your glasses that are not in use in the case and clip them to a belt loop, backpack or purse, no matter you are on a serious hiking, travel, or just for daily use. It keeps everything within easy reach and protected. Always know where they are. Instead of conventional bulky hard case or sleeve for glasses, it is made of premium soft neoprene to preserve light and protective function, totally worry free from scratches. About just 1 oz, easily clip it to your purse, belt or even slacks and they will never weigh you down while makes your glasses at an instant access wherever you may be. It's a perfect eyewear case alternative for travel or daily use. Instead of the hard case that took up too much space and brings too much inconvenience, this soft neoprene zippered design case can be easily folded or roll up in your purse, backpack while not in use. And when put it into use, it is the best way ever to keep your eyewear within easy access. 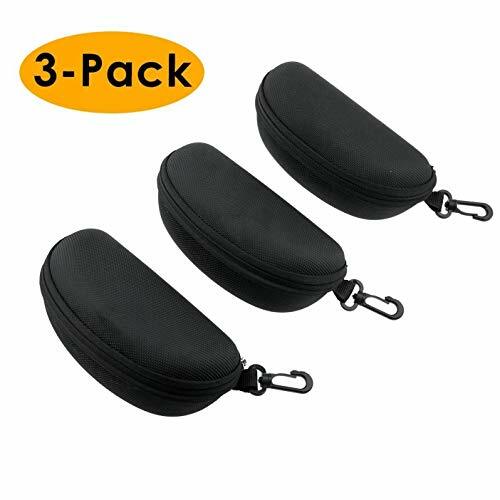 3X Perfect size and protection case for most size eye glasses and sun glasses. Semi hard protective case able to preserve the eye wear from lens scratches, arms bending and braking. Made from EVA - a synthetic rubber-like material, it's bright colored zipper is easy to spot, and the sleek design is perfect for any setting, casual or formal. A carabiner-style keychain clip conveniently attaches the eyewear case to your handbag, backpack or tote bag to carry your reading glasses, goggles or any eyewear. Suitable for outdoor activities such as swimming, hiking, biking, or skiing, or even your daily commute. One size fits most, from small children's glasses to adult frames. If you have any questions about this product by Heth, contact us by completing and submitting the form below. If you are looking for a specif part number, please include it with your message.